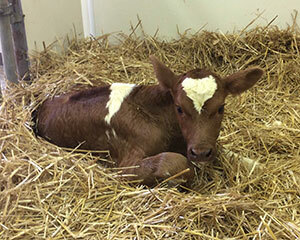 The Milwaukee County Zoo is pleased to announce the birth of a new Ayrshire heifer calf, Kylie. Born September 1 to mother Pearl, she weighed about 75 pounds at birth. When she reaches adulthood, she will weigh between 950 and 1,350 pounds. Kylie’s diet currently consists of two gallons of fresh milk (from our own cows) spread out over three bottle-feedings daily. As she gets older, hay and grain will be added to her diet, and when she is between eight and ten weeks old, she will be weaned off milk and will receive only hay and grain. Ayrshire is a specific dairy breed. Kylie will be considered a heifer until she has a calf, at which point she will be known as a cow. This is also when she will begin producing milk. Ayrshire heifers usually have their first calf at about two years old. Kylie gets her name from “Kyle,” which is a name that originated in the Ayrshire region of Scotland, where her breed originates. She can currently be seen on exhibit in the Northwestern Mutual Family Farm.